In 1963, American civil rights activist martin Luther King Jr. delivered his “I Have a Dream” speech, in which he called for civil and economic rights and an end to racism in the United States. Read this excerpt of his powerful speech with your child, then have them illustrate the speech and what it means to them on the page that follows. 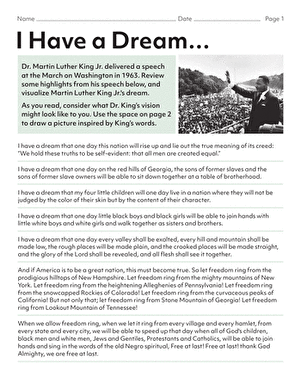 Children can also share their own dreams for a better future with our Martin Luther King Jr. Wish Tags and Marting Luther King Jr. and His Dream activities.